My neighbour went away for three weeks leaving me to look after the fruit trees in her yard. Consequently I have spent the last three weeks chasing bears. 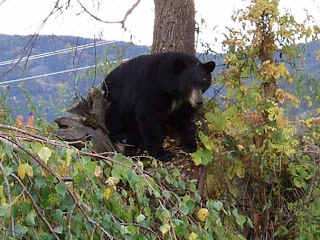 We have quite a large population of black bears in our area and September is the month when they wander into town foraging for food before they hibernate. They LOVE fruit trees! These animals are beautiful to look at, when their fur catches the sunlight it gleams, and despite their name they come in all shades of brown from reddish cinnamon, through chestnut tan , chocolate, and black. Anyone who grows fruit knows it is a toss up between leaving the fruit on the tree until it is ripe enought to eat and risking a broken tree or picking the fruit early and finding it to be useless because it is underripe. Sometimes you get both - the bears will climb the tree to get a few plums or pears and a young tree or a brittle old one will break under their weight. So I have been over at my neighbours' everyday surveying the damage, dragging broken limbs away and picking underripe fruit, hoping the bear is not creeping up behind me! In spite of all this stress I have completed a recent challenging commission. So I am patting myself on the back today because firstly my neighbour got home and didn't grumble about broken trees only thanked me for looking after them, and secondly my customer came to pick up the ring and said she loved it. Phew!